I was brought up in Yorkshire, in the North of England. I have a degree in Music and a Masters in Literature. My final thesis was on Rayuela by Julio Cortázar. Apart from Spain, I’ve lived in Japan, Argentina, Portugal and Mexico. Oh, and I used to be a mariachi musician. You have travelled far and wide. What did you most learn from each country that you lived in? In Japan, I learned that it’s better to beg forgiveness than ask permission and that Hello Kitty weighs the same as 3 apples. In Mexico, I learnt: No es importante ser mariachi sino parecer mariachi. In Argentina, I learnt never to swish the bombilla around in the mate gourd. And in Portugal I learnt to distinguish between a custard tart (pastel de Belem) and a custard tart (nata). How do you find Valencia as place to live and work and create? Valencia has always been good to me and I really love her. That said, it doesn’t always have the best working conditions. So, I think a recipe for success in this city is to have low expectations and a big dose of imagination. There’s a real bohemian element to the city and there’s lots of interesting cultural movements, including some interesting anarchist initiatives, and I feel really proud to be a part of Valencia. The city has also inspired a lot of my writing, both fiction and non-fiction. 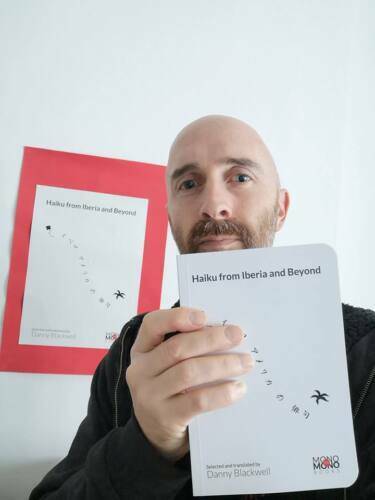 The book is a bilingual anthology of haiku poems written in the languages of the Iberian Peninsula (Basque, Catalan, Galician, Portuguese and Spanish) with all the poems translated into English. The book includes some poems by Valencian poets. I was awarded a ‘Cultura Resident’ grant for the project by the Valencian Museums Consortium. My hope is to make a lot of lesser-known poems and poets available to the English-speaking world. Also, I want to re-evaluate more well-known haiku in Spanish that has been dogged with lots of unfair prejudice by critics over the years. My knowledge of Japanese language and culture, coupled with a love of Iberoamerican literature, puts me in a privileged position to produce a book the likes of which has never been seen before. Essentially, my goal was to make the book I would have loved to have read but that no one had written yet. I’d like to make some more books, maybe translate some more under-investigated poetry into English and also to continue to get my own haiku published. But my overarching goal for the future is basically just to eat well. All you need is love…and cake.